EMI is a São Paulo-based education facility responsible for producing, developing and disseminating industrial marketing knowledge, and supporting the talent of professionals devoted to this area of business. EMI is affiliated with two of the largest educational groups in Brazil: Fundação Dom Cabral (FDC) and Fundação Getúlio Vargas (FGV). 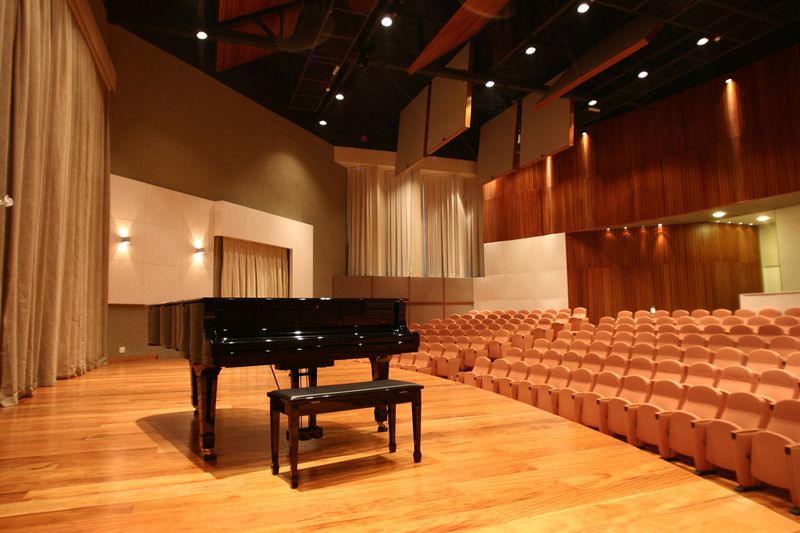 Despite its day-to-day use as a multi-purpose environment for multi-media lecturing, the 360-seat room and its accompanying state-of-the-art surround audio system were designed to provide adaptive acoustical time and frequency response in a way that allows various styles and configurations of both amplified and acoustical music performances, including live recording. This was a prerequisite from the school’s owner, who also happens to be a jazz piano player who periodically gets together with friends for serious “reunion” sessions. The architectural solution involved the installation of 16 rotating elements directly below the isolation ceiling. Depending on the given angle, each panel can reveal two distinct surfaces, each with distinct sound reflection properties. 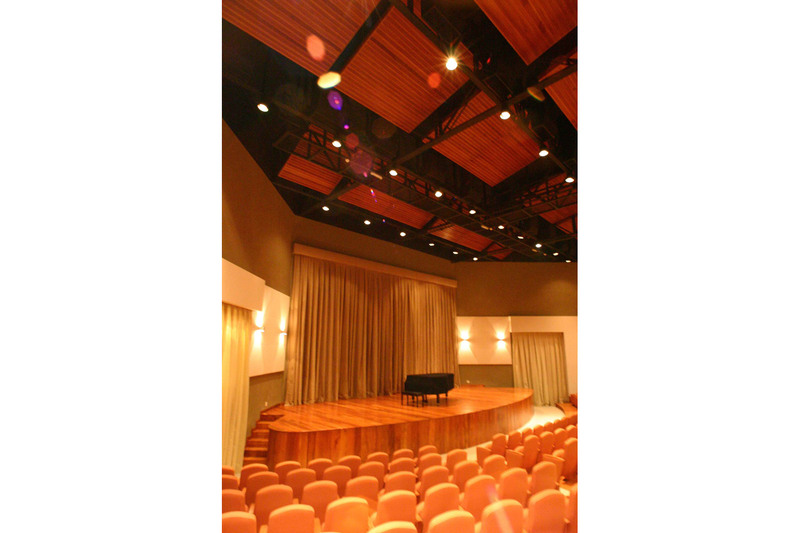 The panels provide the required amount of absorption, diffusion and frequency response properties for any possible musical situation. The overall mass and weight of the panels required a custom, mechanically-operated steel structure to be put in place to easily and safely maneuver the panels. When WSDG was hired, the building structure had already been conceived and built. 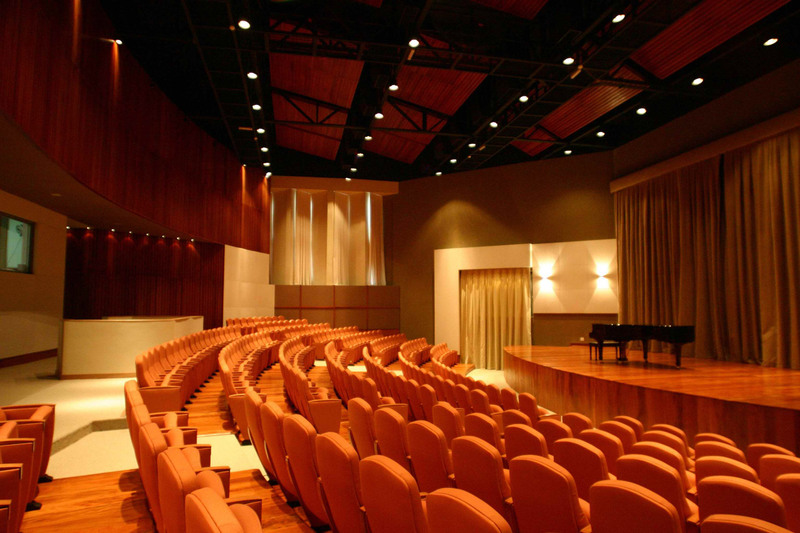 The back wall of the theater presented a particular challenge because of its concave shape- this reflective curve caused sound waves from the stage to bounce back from the wall, creating an undesired slap-back echo and feedback effect. 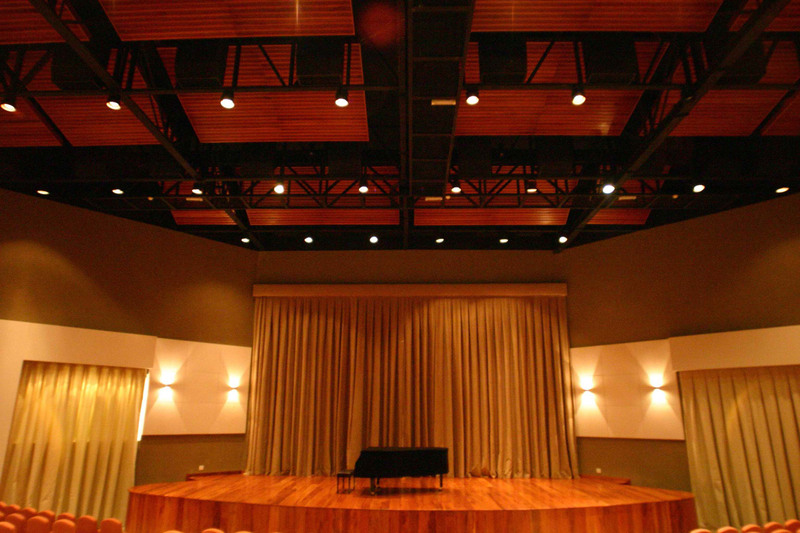 WSDG resolved this problem by installing a large, wood diffuser, which also worked as a resonator for low frequency absorption. The frequency response of Room I shown on the graph below (extracted from SIA Smaart software) indicates, from the mix position, the effectiveness of all the acoustical treatments which were installed. To achieve a very low noise floor inside the room, as a live recording situation would require, the isolation systems were designed to provide a NC20 (Noise Criteria) based on acoustical measurements of the exterior noise. Special care was taken for the air conditioning system to match such a low noise floor, which used large ducts for controlled air speed and special sound attenuators at critical points. The audio system designed consists of a 7.1 surround configuration, controlled by a 48 channel Yamaha digital console. This is connected digitally to a recording system located in the back of the room, beside a dedicated translation booth utilized for international clients. 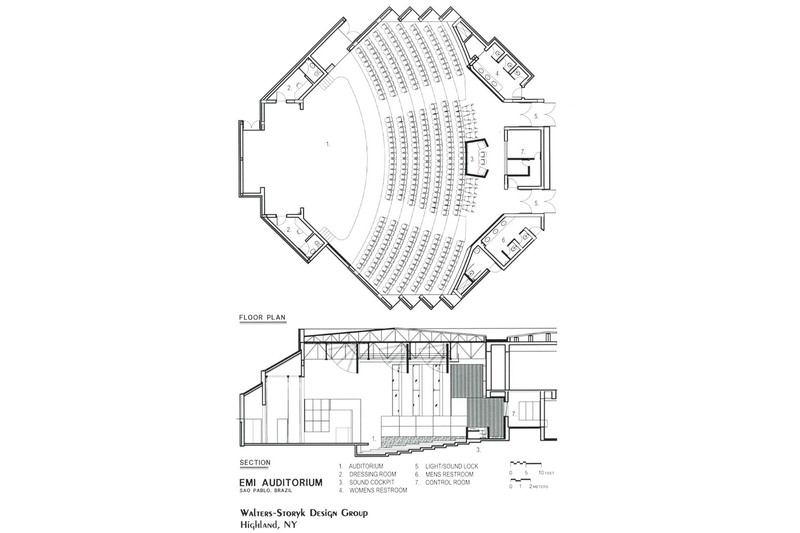 Walters-Storyk Design Group was responsible for both the design and construction of the theater. 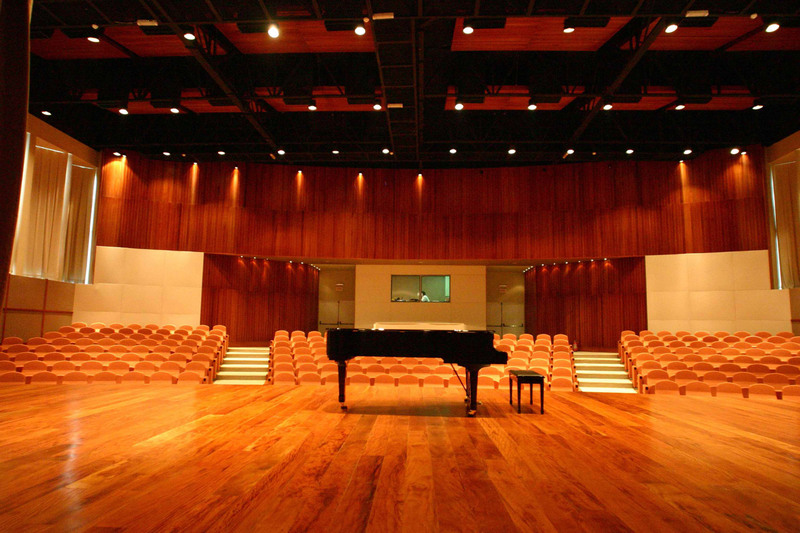 All the wood elements used for the acoustic treatments, including the stage floor, were created from recycled materials of demolished old farms from the northern area of Brazil to create a unique sound character inside the room.